"Mohamed Farah" redirects here. For Somali military commander and faction leader, see Mohamed Farrah Aidid. Sir Mohamed "Mo" Muktar Jama Farah, CBE, OLY (born 23 March 1983) is a British distance runner. The most successful British track athlete in modern Olympic Games history, he is the 2012 and 2016 Olympic gold medallist in both the 5000 m and 10,000 m. Farah is the second athlete in modern Olympic Games history, after Lasse Virén, to win both the 5000 m and 10,000 m titles at successive Olympic Games. He also completed the 'distance double' at the 2013 and 2015 World Championships in Athletics. He was the second man in history, after Kenenisa Bekele, to win long-distance doubles at successive Olympics and World Championships, and the first in history to defend both distance titles in both major global competitions – a feat described as the 'quadruple-double'. Since finishing 2nd in the 10,000 metres at the 2011 World Championships in Athletics, Farah had an unbroken streak of ten global final wins (the 5000m in 2011, the 10,000m in 2017 and the double in 2012, 2013, 2015 and 2016). The streak ended in Farah's final championship track race, when he finished second to Ethiopia's Muktar Edris in the 2017 5000 metres final. In his final track race, the 2017 Diamond League Final in Zurich in August 2017, Farah gained his revenge, edging out world champion Edris to win his first and only IAAF Diamond League title at 5000 metres. On the track, he mostly competed over 5000 metres and 10,000 metres, but has run competitively from 1500 metres to the marathon. In 2017 he indicated his intention to switch wholly to road racing following victory at his final track race, the 2017 IAAF Diamond League 5000 metres final. His running style has been described as "bouncy" and tactical, which he has attempted to alter for a more efficient and energy-saving stride pattern, especially in the longer distances. Farah runs distance races tactically, a style which is aided by his quick sprint finish. Born in Mogadishu, Somalia, to an Isaaq Somali family from Gabiley, Somaliland, Farah went on to be based in London and ran for Newham and Essex Beagles athletics club, training at St Mary's University College, Twickenham from 2001 to 2011. Farah is the European record holder for the 1500 m, 10,000 m, half marathon, marathon, and two miles, the British record holder for the 5000 m, the European indoor record holder for 5000 m, the British indoor record in the 3000 m and the current indoor world record holder for the two miles. Farah is the most decorated athlete in British athletics history, with ten global titles, and was the first British athlete to win two gold medals at the same world championships, although Dame Kelly Holmes had achieved the feat at an Olympic Games. His five gold medals at the European Athletics Championships make him the most successful athlete in individual events in the championships' history. He has won the European Athlete of the Year award and the British Athletics Writers Association British Athlete of the Year award more than any other athlete, three times and six times respectively. Farah was appointed Commander of the Order of the British Empire (CBE) in 2013 and was knighted by Queen Elizabeth II in the 2017 New Year Honours for services to athletics. He won the 2018 Chicago Marathon in a time of 2:05:11, a new European record. Mohamed Muktar Jama Farah was born on 23 March 1983 in Mogadishu, Somalia. Although Farah's family was originally from Gabiley, they were living in Mogadishu, Somalia as his father was a businessman there. After fleeing from Mogadishu to Gabiley with his family, Farah then spent his early childhood as a refugee in Djibouti with his twin brother. He moved to Britain at the age of eight to join his father, speaking barely a word of English. His grandfather, Jama, was born in the British protectorate of Somaliland. His father, Mukhtar Farah, is an IT consultant and a British citizen, who was born in London and grew up in Hounslow. Farah attended Isleworth and Syon School, and Feltham Community College. His athletic talent was first identified by physical education teacher Alan Watkinson. Farah's ambition was to become a car mechanic or play as a right winger for Arsenal football club. He later joined the Borough of Hounslow Athletics Club in west London. Farah represented Hounslow at cross-country in the London Youth Games. In 1996, at the age of 13, he entered the English schools cross-country and finished ninth. The following year he won the first of five English school titles. Recognising his talent, athletics philanthropist Eddie Kulukundis paid the legal fees to complete Farah's naturalisation as a British citizen, allowing Farah to travel to competitions without visa issues. Farah's first major title was at 5000 metres at the European Athletics Junior Championship in 2001, the same year that he began training at St Mary's University College, Twickenham. That year, Farah became one of the first two athletes in the newly formed Endurance Performance Centre at St Mary's. He lived and trained at the College, and took some modules in an access course before becoming a full-time athlete as his career progressed. Farah at the 2008 European Cross Country Championships. In 2005, Farah moved in with Australian Craig Mottram and a group of Kenyan runners that included 10,000 m world number one Micah Kogo. "They sleep, eat, train and rest, that's all they do but as an athlete you have to do all those things. Running with Craig made me feel more positive," Farah said. "If I ever want to be as good as these athletes I've got to work harder. I don't just want to be British number one, I want to be up there with the best." In July 2006, Farah recorded a time of 13 minutes 9.40 seconds for 5000 m to become Britain's second-fastest runner after Dave Moorcroft. A month later, Farah won the silver medal in the European Championship 5000m in Gothenburg. Coaches Alan Storey and Mark Rowland made sure that Farah remained competitive and a few words from Paula Radcliffe before the 5000 m final inspired Farah. He has stated that: "She said to me, 'Go out and be brave. Just believe in yourself'." In December 2006, Farah won the 2006 European Cross Country Championships in San Giorgio su Legnano, Italy. Farah represented the UK at 5000 m in the 2007 World Championships in Osaka, Japan. Farah finished sixth in a time of 13:47.54. In May 2008, Farah ran 10,000 m events, which was the fastest UK men's time for almost eight years. However, he was knocked out before the 5000 m final at the 2008 Olympics in Beijing. In January 2009, Farah set a new British indoor record in the 3000 metres, breaking John Mayock's record with a time of 7 minutes 40.99 seconds in Glasgow. A few weeks later, he broke his own record by more than six seconds with a time of 7 minutes 34.47 at the UK Indoor Grand Prix in Birmingham, a performance which commentator Steve Cram called "the best performance by a male British distance runner for a generation". Farah attributed his good form to a spell of winter training at altitude in Ethiopia and Kenya. In March 2009 he took gold in the 3000 m at the European Indoor Championships in Turin, recording a time of 7 minutes 40.17. Farah competed at the 2009 World Championships in Athletics: he was in the leading pack early on in the 5000 metres race and eventually finished seventh – the best by a European runner. After the championships, he scored a victory in his first road competition over 10 miles, winning the Great South Run in 46:25 to become the third fastest Briton in spite of strong winds. Farah was one of the favourites to upset Serhiy Lebid's dominance at the 2009 European Cross Country Championships. However, Lebid was never in contention as Farah and Alemayehu Bezabeh were some distance ahead throughout the run. Farah was overtaken by Bezabeh in the latter stages of the race, leaving the Briton with a second consecutive silver medal at the competition. He did not manage to attend the medal ceremony, however, as he collapsed immediately after the race and needed medical attention. After a close third place behind Edwin Soi at the BOclassic, Farah competed in the short course race at the Great Edinburgh Cross Country. He was the favourite to win and surged ahead to build a comfortable lead. However, he appeared tired in the latter stages and finished third behind British runners Ricky Stevenson and Steve Vernon. Farah again required post-race medical attention and subsequent tests revealed he had low levels of iron and magnesium. He was prescribed supplements for the condition and his high altitude training plans in Kenya were unaffected. Farah won the 2010 London 10,000 in late May in a time of 27:44, in the process beating 10K world record holder Micah Kogo. His success continued the following week at the European Cup 10,000 m. There, he improved his track best by nearly 16 seconds, finishing in a time of 27:28.86. Farah won by a margin of over forty seconds ahead of second placed Abdellatif Meftah. After training in Africa, he returned to Europe for the 2010 European Athletics Championships. He took the 10,000 metres gold medal, overtaking Ayad Lamdassem with two laps to go and finishing the race unpressured in a time of 28:24.99. This was Farah's first major title and also the first European gold medal in the event for Great Britain. He then went on to win the 5000 m from Jesus España, becoming only the fifth man in the 66-year history of the European Championships to achieve the 5000 m/10,000 m double, and the first for 20 years, following in the footsteps of the Czech Emil Zátopek in 1950, Zdzislaw Krzyszkowiak of Poland in 1958, Finland's Juha Vaatainen in 1971 and Salvatore Antibo, of Italy, in 1990. On 19 August 2010, at a Diamond League meeting in Zürich, Farah ran 5000 m in 12:57.94, breaking David Moorcroft's long-standing British record and becoming the first ever British athlete to run under 13 minutes. In December 2010, Farah was named track-and-field athlete of the year by the British Olympic Association. He closed the year at the BO classic and just missed out on the 10,000 m title, losing to Imane Merga in a sprint finish by 0.2 seconds. 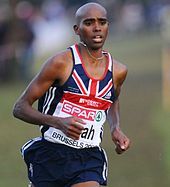 2011 was a successful year for Farah, beginning on 8 January at the Edinburgh Cross Country, where he defeated the top four finishers of that year's European Championships to take victory in the long race. In February 2011, Farah announced that he would be relocating to Portland, Oregon to work with new coach Alberto Salazar, train alongside Galen Rupp, and avoid the attention of the British tabloids. On 19 February 2011 in Birmingham, England, Farah broke the European 5000 m indoor record with a time of 13:10.60, at the same time taking ten seconds off the 29-year-old British indoor record of Nick Rose. On 5 March 2011, he won gold in the 3000 metres at the European Indoor Championships. On 20 March, Farah also won the NYC Half Marathon in a time of 1:00:23, a new British record. He and training partner Galen Rupp had originally planned on running a 10,000 m race in New Zealand. However, after the race was cancelled due to the Christchurch earthquake and damage done to the track, they entered the half-marathon in New York. On 3 June 2011, at a Diamond League meeting in Eugene, Oregon, Farah won the Prefontaine Classic's 10,000 m event in 26:46.57, setting a new British and European record. On 22 July 2011, at a Diamond League meeting in Monaco, he set a new British national record in the 5000 m with a time of 12:53.11. Farah edged out American Bernard Lagat to win the race. In the 2011 World Championships in Athletics in Daegu, South Korea, Farah made a major breakthrough on the world stage by taking the silver medal in the 10,000 m and then the gold in the 5000 m. He became the first British man to win a World Championships medal over either distance. Farah had in fact been more strongly favoured to take the 10,000 m title, but was narrowly beaten in a last lap sprint by Ethiopian Ibrahim Jeilan. In the 5000 m, he overcame Lagat, beating him into second place. Following the race, Dave Moorcroft, former 5000 metres world record holder, hailed Farah as "the greatest male distance runner that Britain has ever seen". At the European Championships in June 2012, he won the 5000m. This then made Farah the first athlete to win this European title more than once. At the London 2012 Olympics, on 4 August, Farah won the 10,000 m gold in a time of 27:30.42. This was Great Britain's first Olympic gold medal in the 10,000 m, and came after two other gold medals for the country in the same athletics session. His training partner, Galen Rupp of the United States, took second place. At the time both runners were a part of the Nike Oregon Project coached by Alberto Salazar. Farah stated that he would observe his Ramadan fast later in the year. On 11 August 2012, Farah made it a long-distance double, winning the 5000 metres in a time of 13:41.66. The noise from the crowd in the 5,000 m race was so loud it made the camera shake and distorted the photo-finish image. He dedicated the two golds to his twin daughters. On 23 August 2012, Farah returned to the track at a Diamond League meet in Birmingham, where he capped off a winning season with another victory over a distance of two miles (3.2 km). Following his 2012 successes, Farah was appointed Commander of the Order of the British Empire (CBE) in the 2013 New Year Honours for services to athletics. The move was met with anger by many in the general public, including erstwhile Minister of Sports Gerry Sutcliffe, who felt that Farah instead deserved a higher accolade. Farah's former physical education teacher Alan Watkinson similarly indicated that he was disappointed that Farah was not knighted and that the decision "discredits the system although it's still a fantastic achievement for Mo and well deserved." However, deputy Prime Minister Nick Clegg cited Farah's Olympic double gold win in his 2013 New Year's message and 2012 Autumn conference, and David Cameron on August 2013 expressed support for a knighthood for Mo Farah. On 19 July 2013, at the Herculis meeting in Monaco, Farah broke the European 1500 m record with a time of 3:28.81. The feat meant that he was the sixth fastest man ever over the distance, overtaking Steve Cram's 28-year-old British record and Fermín Cacho's 16-year-old European record. It also made Farah the seventh man, behind Saïd Aouita, Daniel Komen, Ali Saïdi-Sief, Hicham El Guerrouj, Augustine Kiprono Choge and Bernard Lagat to break both the 3:30 barrier in the 1500 metres and the 13-minute barrier in the 5000 metres, as well as the only athlete in history to run sub 3:30, sub 13-minute and sub 27-minute for 1500 metres, 5000 metres and 10,000 metres respectively. Additionally, he has a sub 1 hour run in the half-marathon. Farah during his gold medal victory in the men's 3,000 metres event at the 2013 London Grand Prix. The following month, Farah won the London Diamond League Anniversary Games' 3000 metres event in a time of seven minutes and 36.85 seconds. He twice broke the national record in the half-marathon, first on 24 February in New Orleans, then broke his own record on 15 September in the BUPA Great North Run. On 10 August 2013, Farah stayed in front of Ibrahim Jeilan to win the 10,000 m event at the World Championships in Moscow. The victory was his fourth global title. On 16 August 2013, Farah won the 5,000 m event, in the process becoming double world and Olympic champion. After this victory, BBC commentator Brendan Foster and Sebastian Coe called Farah 'Britain's greatest ever athlete'. Farah became only the second man in history to win long-distance titles at successive editions of the Olympics and World Championships, after Kenenisa Bekele's 2008–09 feat. He was the first British athlete to win two individual gold medals at a World Championships. In December 2013, Farah was the second favourite, behind Wimbledon tennis champion Andy Murray, to become the BBC Sports Personality of the Year. When he was asked what drove him to keep pushing back the boundaries of athletic accomplishment, he noted sprinter Usain Bolt's record breaking streak as a motivating example of what is possible for all dedicated athletes. Farah was a finalist for the 2013 IAAF World Athlete of the year award. In preparation for his marathon debut, he also extended his training schedule to 120 miles a week. Farah on the way to victory in the 5000m men final of the 2014 European Athletics Championships. Farah began 2014 preparing for the year's London Marathon, his first such run. He described running the event as a longstanding ambition of his, particularly to do so in London. Farah finished in eighth place in a time of 2:08.21. This was outside Steve Jones' GB record, but set a new English national record. Farah was due to compete at the 2014 Commonwealth Games in Glasgow. However, he withdrew due to illness from a stomach ailment and an infection caused from having a tooth removed. Farah later appeared in Zürich at the 2014 European Athletics Championships. He successfully defended his 5000 m title and won a gold in the 10,000 m, thus completing another major championship double. This made him the most successful individual in the history of the European Athletics Championships, with five titles to his name. On 7 September 2014, Farah competed in the Great North Run, a British half marathon. He won the race with a personal best time of 1:00:00, exactly 1 hour. On 21 February 2015, Farah broke the indoor two-mile world record at the Birmingham Indoor Grand Prix. He ran an 8:03.4 to break Kenenisa Bekele's record. On 22 March 2015, Farah broke the European record for half marathon in Lisbon. He ran a time of 59 minutes, 32 seconds, 20 seconds, surpassing the record set 14 years previously by Spain's Fabián Roncero. He repeated his long-distance gold medal double at the 2015 World Championships in Athletics. His win in the 10,000m made him the oldest World Championship winner in that event, at age 32. On 26 March, Farah received a bronze medal in the 2016 IAAF World Half Marathon Championships in Cardiff, finishing in 59:59, less than one second ahead of Abayneh Ayele. On 20 February, Farah won the Glasgow Indoor Grand Prix 3000m event. On 5 June 2016, Farah broke the 34-year-old British 3000 metre record set by Moorcroft by winning the Diamond League in Birmingham, a win he dedicated to the recently deceased boxer Muhammad Ali. In July 2016 Farah set the concurrent world-leading time in the 5000m in winning the Diamond League in London. He won the 10,000m at the Diamond League in Eugene, in a time of 26:53.71 which remained the second-fastest time in the world of the year. On 13 August, Farah won a gold medal in the 10,000 metres at the Rio Olympics, making it the first time a Briton had won three athletic gold Olympic medals. After being accidentally clipped on the back of the heel by American Galen Rupp on the 10th lap he fell, but went on to win gold with the time of 27:05.17. Rupp slowed after Farah's fall to check his condition and finished in 5th place with a time of 27:08.92. In the final lap Farah battled Paul Tanui, who took the lead with 300 metres remaining. Farah edged him out with 100 metres to go. Tanui finished in second place with a time of 27:05.64. On 20 August, Farah went on to win a second gold medal in the 5,000 metres at the Rio Olympics. Coming into the 31st Olympiad, Farah was trying to win gold medals in the 10,000 metres and 5,000 metres to double his success from the London Olympics. Farah held off the lead he had set and finished with a time of 13.03.30, making it only the second time someone has retained the 5000m and 10,000m Olympic titles, after Lasse Virén of Finland in 1972 and 1976. In September 2016, he won the Great North Run for a record third consecutive year. In 2016, he was the fastest person from the European continent over two middle distance events and three long-distance events; the 1500 metres, 3000 metres, 5000 metres, 10,000 metres and the half-marathon respectively. His ninth global title, the 5000m in Rio, made him surpass Kenenisa Bekele as the most frequent winner of gold in history for major long-distance events. He remained unbeaten in 2016 in the 3000m as well as in six races over the 10,000m and 5,000m distances. Farah's distance double was voted the second most memorable TV moment of the year by British voters according to an ASDA poll. Farah announced that he would switch from track events to the marathon after the 2017 World Championships in Athletics. He won the 10,000m event, and came 2nd in the 5,000m event after Ethiopia's Muktar Edris. Farah won his final two track events, in the Diamond league, in Birmingham and Zurich. On 24 August 2017, he won his final 5,000m in the Diamond league, finishing in 13:06.05, in a final sprint against Paul Chelimo and Muktar Edris just behind in 13:06.09. On 20 August 2017, Farah again reiterated his decision to move to the marathon full-time, and caused headlines when he announced after running his last 10,000m race on British soil at the Muller Grand Prix in Birmingham that he would never again run in a GB vest. On 10 September 2017, Farah won the Great North Run for a record fourth consecutive time. He finished in 1:00:06, 6 seconds ahead of Jake Robertson. On 31 October, Farah split from Alberto Salazar in order to be coached by Gary Lough, husband and former coach of Paula Radcliffe. Salazar stated that the split was mutual and he would be happy to advise Farah in the future. In March 2018, in preparation for the London Marathon, Farah won the inaugural London Big Half Marathon, his first race in six months. On 22 April 2018, Farah came third in the London Marathon in a time of 2:06:22, comfortably beating the British record of 2:07:13 set by Steve Jones in 1985. On 9 September 2018 Farah won the Great North Run for a record-extending 5th consecutive time. At the Chicago Marathon Farah claimed his first win over the marathon distance and in the process set a new European record of 2 hours 5 minutes and 11 seconds to beat the previous record by 37 seconds. Mo Farah (left), Bashir Abdi and Daniel Wanjiru compete in the 2019 London Half Marathon - finishing in that order. He has also confirmed that he may run in the 10,000 metres at the World Championships in Doha in late 2019, although this would depend on the result of the 2019 Big Half Marathon. This possibility was later confirmed by Neil Black, performance director of British Athletics, who has said that Farah had received financial backing from the National Lottery in anticipation for both his participation in the Championships, as well as for the Tokyo Olympics. On 10 March 2019, Farah won his second London Big Half Marathon, and again hinted at running the 10,000m at the World Championships in October 2019. Mo Farah completing his "Mobot" signature pose at the 2013 London Anniversary Games. Farah often marks victories with a celebration dance known as the "Mobot". He adopted the move following a television appearance in May 2012 opposite sports presenter Clare Balding, on the panel game show A League of Their Own. The host James Corden suggested to the panelists that they should think of a new dance to mark Farah's winning celebration, and Balding subsequently came up with the "M" gesture called "Mobot". While demonstrating it for the first time, she indicated that the part of the move intended to represent the "M" in "Mo" was inspired by the dance to "YMCA", a popular song by the Village People. Corden himself then named it as the "Mobot". A robot was named "Mobot" at a university research exhibition, in honour of Farah's celebration. Farah has since used the pose as part of a charity to raise funds for his foundation. Virgin Media has promised to donate £2 for every YouTube video that is uploaded with someone doing the mobot. Farah often uses the sign-off Shabba in online postings. Farah has a twin brother, Hassan, who lives in Somalia. They were separated at eight years old, when Mo, his two younger brothers, and his mother joined their father, who had been working and studying in the UK. Hassan, however, was unwell and unable to travel, so stayed behind with family in Djibouti. When Farah's father returned to collect Hassan, the family he was living with had moved and could not be found. Farah and his twin ended up being separated for twelve years. Hassan is now a telecoms engineer with a wife and five children. Farah has a third younger brother, who was also born after the family's move to London. In April 2010, Farah married his longtime girlfriend Tania Nell in Richmond, London. Other athletes at the wedding included Paula Radcliffe, Steve Cram, Hayley Yelling, Jo Pavey, Mustafa Mohamed and Scott Overall, who was an usher. Farah has a stepdaughter named Rihanna from this relationship. He and his wife have twin daughters called Aisha and Amani, born in August 2012. In 2015, Farah and Nell had a son called Hussein. From 2011 to 2017, Farah lived with his family in Portland, Oregon, so that he could train full-time with the Nike Oregon Project. At the end of 2017 he cut ties with his coach Alberto Salazar and decided to return to London. His statement said "Tania and I realised how much we have missed spending time with our friends and family - and the kids are so happy here, too. We want the kids to grow up in the UK. It's the right thing to do for my family. Farah is a Muslim, and is an active supporter of the Muslim Writers Awards. Islam is an important part of his preparation: "I normally pray before a race, I read dua [Islamic prayers or invocations], think about how hard I've worked and just go for it." He notes that "the Qur'an says that you must work hard in whatever you do, so I work hard in training and that's got a lot to do with being successful. [It] doesn't just come overnight, you've got to train for it and believe in yourself; that's the most important thing." An RISSC publication named Farah as among the 500 most influential Muslims in the world in 2013. Farah is also a fan of Arsenal F.C., and has trained with its first team squad. He has indicated a desire to become a fitness coach at the Emirates Stadium in Holloway once he retires so as to improve its conditioning record. In October 2013, he launched a book titled Mo Farah, Twin Ambitions: My autobiography in Canary Wharf, London. Farah has a large following on social media. This includes roughly 1.5 million followers on Twitter and 1.1 million on Facebook. In 2013, he was the top-ranked query for a sportsperson on the search engine Microsoft UK Bing who was not a footballer. Farah at the 2010 London Youth Games Hall of Fame and Awards Evening. Farah is additionally involved in various philanthropic initiatives, launching the Mo Farah Foundation after a trip to Somalia in 2011. The following year, he participated in ITV's The Cube and won £250,000 for his foundation, becoming the first and only person to win the top prize on the show. Along with other high-profile athletes, Farah later took part in the 2012 Olympic hunger summit at 10 Downing Street hosted by Prime Minister David Cameron, part of a series of international efforts which have sought to respond to the return of hunger as a high-profile global issue. Olympic memorabilia featuring and signed by Farah has also been auctioned off to raise funds for the London Organising Committee of the Olympic and Paralympic Games (LOCOG). In 2013, he joined legislators and activists in a campaign urging Barclays Bank to repeal its decision to withdraw from the UK remittance market. Farah often used money transfer operators to send remittances to family, and some of the world's largest organisations and charities, including the UN and his own foundation, likewise paid staff and channelled funds through these services. In March 2013, Farah, singer Robbie Williams, and a number of other celebrities also urged Chancellor George Osborne to clamp down on global corporations that avoid paying taxes in poor countries in which they operate. He has also expressed support for research into brain tumours. On August 7, 2017, Farah became a global ambassador for Marathon Kids. Speaking of his new role, Farah said, "I love running, and it's given me and my family so much. As a dad, I know how important it is for my children to be active, and I'm honoured to have the chance to inspire kids to run with Marathon Kids." Farah has endorsement deals with a number of companies, including PACE Sports Management, Nike, Lucozade, Quorn, Bupa and Virgin Media. His work with Nike Inc. includes marketing of clothing and shoes. In order to preserve his earnings after taxes, Farah also applied in 2013 to have his main place of residence changed to Portland, where he spends most of the year training. In December 2013, Farah signed a marketing deal with Quorn, part of a multimillion-pound campaign aimed at doubling the firm's sales. He led television advertisements for Quorn's vegetarian forms of protein, with the campaign scheduled to last throughout the following year. In 2012–2013, Farah intimated that he had been stopped a number of times by U.S. Customs officials under suspicion of being a terrorist, which he attributed to confusion between his full name "Mohamed" and a computerised check-in process. On one occasion after the 2012 Olympics, he said that he had attempted to prove his identity by showing his Olympic gold medals to customs officials, but that this was not accepted. After U.S. President Donald Trump signed an executive order temporarily suspending the immigration of Somali-born U.S. permanent residents, Farah made a statement on his Facebook account stating that "I will have to tell my children that Daddy might not be able to come home." In March 2018, Farah posted a video on Instagram depicting what he alleges to be racial harassment at Munich Airport. Farah's anti-doping record has come under scrutiny several times during his track career, although he has never been found guilty of an anti-doping rule violation. He has long insisted he has never used banned substances and has often criticised the news media for reporting about issues surrounding his anti-doping record. In July 2017, the hacking group Fancy Bears leaked a database from International Association of Athletics Federations that showed Farah was once suspected of doping after he recorded "atypical" values on his Athlete Biological Passport in 2016. The controversy came after it emerged that an IAAF expert had regarded Farah's blood values as particularly suspicious, and had written next to his name: “Likely doping; Passport suspicious: further data is required”. However, Farah was apparently cleared of wrongdoing by April 2016 after a separate leaked spreadsheet said his records had been “now flagged as normal with the last sample”. In 2010 and early 2011, Farah missed two drug tests in a twelve-month period. A third missed test would have resulted in an anti-doping rule violation. In summer 2015, Farah provided a public blood test in an effort to dispel concerns following various events, including pictures posted to Facebook by Hamza Driouch, who is banned from competing for doping violations, which showed him training with Farah. Farah was seen running directly in front of Driouch during a training session. Management for Mo Farah suggested, however, that the training session was merely Farah employing local athletes to pace him and that he does not have any control over who joins in the training session. Hamza Driouch has been officially banned from attending training sessions in any capacity for two years from 31 December 2014. In June 2015, in a BBC Panorama documentary, it was alleged that Farah's coach Alberto Salazar was guilty of doping offences at the Nike Oregon Project. The programme did not accuse Farah of any wrongdoing. On 6 June 2015 Farah held a press conference in which he expressed his anger that his name was "being dragged through mud". He withdrew from a 1500 metres event at the Birmingham Diamond League race on 7 June, describing himself as "emotionally and physically drained". Farah said he had been told by Salazar he was not involved in Mary Slaney's career at the time she tested positive for testosterone but this version of Salazar's history has been challenged. In February 2017 Farah issued a statement in which he claimed to be a "clean athlete" after a leaked report suggested Salazar may have broken anti-doping rules to boost the performance of some of his athletes. 2016, Nickelodeon Kids' Choice Award for Inspirational Athlete. 2017, Created a Knight Bachelor for services to Athletics. All information from Association of Road Racing Statisticians. Cardiff native Sonny Double 1 released a biographical grime musical named Mo Farah in 2016. ^ "Athletes". IAAF.org. Retrieved 29 August 2011. ^ a b "BBC Sport – Athletics – Mo Farah changes coach to assist Olympic preparation". BBC News. 18 February 2011. Retrieved 16 August 2013. ^ a b Farah, Mo. Twin Ambitions – My Autobiography. p. 250. Retrieved 19 July 2016 – via Google Books. ^ "Charles Van Commenee". The Gordon Poole Agency Ltd. Archived from the original on 8 December 2015. Retrieved 14 December 2015. ^ "The world is at Farah's feet as guru helps him go the distance". The Independent. 15 March 2009. Retrieved 14 December 2015. ^ Greechan, John (4 June 2016). "Mo Farah should be chasing Olympic gold not world records, says former world champion Ian Stewart". Mail Online. Retrieved 19 July 2016. ^ "Mo Farah: The stats behind his golden track career". BBC. Retrieved 27 February 2018. ^ a b c d e f g h i j "Profile of Mo Farah". International Association of Athletics Federations. ^ Lindstrom, Sieg. "Sir Mo Farah | British athlete". Britannica.com. Retrieved 19 July 2016. ^ "2016 Summer Olympics Bio – Mo Farah". ESPN. Retrieved 21 August 2016. ^ Hart, Simon (19 November 2013). "Coup for UK Athletics as Mo Farah coach Alberto Salazar agrees to help Britain's middle and long-distance runners". The Daily Telegraph. Retrieved 14 November 2017. ^ Ingle, Sean (17 August 2013). "Mo Farah: 'World championship wins tougher than London 2012'". The Observer. Retrieved 13 August 2014. ^ a b Ingle, Sean (12 December 2013). "Mo Farah changing stride for marathon task". The Irish Times. (Subscription required (help)). ^ Monti, Dave (10 August 2013). "With Best Tactics and Speed, Britain's Mo Farah Captures World 10,000m Title". Let's Run. Retrieved 4 October 2015. ^ "Bank of America Chicago Marathon". results.chicagomarathon.com. Retrieved 2018-10-07. ^ Einashe, Ismail. "Mo and me". Retrieved 22 April 2018. ^ a b Fordyce, Tom (5 August 2012). "Ennis, Farah and Rutherford give GB athletics its finest hour". BBC Sport. Retrieved 5 August 2012. ^ Blunden, Mark (3 August 2012). "Team GB's Mo Farah's inspirational former PE teacher to cheer him at London 2012". The Independent. ^ Farah, Mo (2013). Twin Ambitions – My Autobiography. p. 2. ^ Lusher, Adam (4 August 2012). "London 2012 Olympics: Mo Farah wins gold medal in the 10,000 metres final". The Daily Telegraph. ^ Cohen, David; Freeman, Simon (6 August 2012). "London 2012 Olympics: How a love that went the distance took Mo Farah to the gold medal". London Evening Standard. Retrieved 15 October 2013. ^ Fahy, Dylan (13 June 2008). "Brian Viner interviews Mo Farah". The Independent. Retrieved 15 August 2012. ^ a b c d Fanin, Isaac (26 July 2007). "Farah stars, with support". BBC Sport. Retrieved 23 June 2008. ^ Bailey, Mark (21 December 2013). "Mo Farah: 'My secret skill is making animal noises'". The Observer. Retrieved 13 August 2014. ^ Milmo, Cahal (29 July 2010). "How Britain's athletics hero escaped the chaos of Somalia". The Independent. London. ^ "Farah's golds should not be devalued by Salazar accusations, says Coe". Om Riyadat. 13 September 2016. Archived from the original on 19 September 2016. Retrieved 13 September 2016. ^ "Hall of Fame". London Youth Games.org. Archived from the original on 7 March 2013. Retrieved 16 August 2013. ^ Hart, Simon (11 September 2011). "London 2012 Olympics: Mo Farah's rise to the pinnacle of his sport is a quintessential British success story". The Daily Telegraph. Retrieved 19 July 2015. ^ Farah, Mo (10 October 2013). Twin Ambitions - My Autobiography. Hodder & Stoughton. p. 81. ISBN 978-1-4447-7959-2. Retrieved 19 July 2015. ^ "FARAH, Mo: Profile". PACE Sports Management. Archived from the original on 23 July 2011. Retrieved 23 June 2008. ^ "Farah storms to European success". BBC Sport. 10 December 2006. ^ "5000m Results, Osaka 2007". IAAF. Archived from the original on 26 October 2007. Retrieved 21 August 2016. ^ Holt, Sarah (2 September 2007). "World Championships 2007 Day Nine: As It Happened". BBC News. Retrieved 21 August 2016. ^ "Farah breaks 3000m indoor record". BBC Sport. 31 January 2009. Retrieved 3 February 2009. ^ "Farah breaks record in Birmingham". BBC Sport. 21 February 2009. Retrieved 22 February 2009. ^ Cram, Steve (24 February 2009). "Funny guy Farah is now seriously fast". The Guardian. ^ "Mo Farah beats own record on good day for British athletes". The Daily Telegraph. 21 February 2009. ^ "Farah cruises home to 3,000m gold". BBC Sport. 7 March 2009. ^ Martin, Dave (25 October 2009). "Farah scores tremendous victory while Monteiro destroys opposition in Portsmouth". IAAF. Retrieved 25 October 2009. ^ Wenig, Jorg (12 December 2009). "Farah: "I am in better shape than a year ago" – Euro Cross Country Championships press conference". IAAF. Retrieved 13 December 2009. ^ "Hayley Yelling clinches shock win as Mo Farah collapses". BBC Sport. 13 December 2009. Retrieved 12 January 2010. ^ Sampaolo, Diego (1 January 2010). "Three-peat for Soi in Bolzano". IAAF. Retrieved 12 January 2010. ^ "Mo Farah returns to training after medical tests". BBC Sport. 12 January 2010. Retrieved 12 January 2010. ^ "Mo Farah sets new British 10,000m road record". BBC Sport. 31 May 2010. Retrieved 6 June 2010. ^ Ramsak, Bob (6 June 2010). "Farah and Monteiro take European Cup 10,000m victories". IAAF. Retrieved 6 June 2010. ^ "European Athletics 2010: Brit Farah wins 10,000 m gold". BBC Sport. 27 July 2010. Retrieved 31 July 2010. ^ "European Athletics Championships 2010: Mo Farah wins 5,000 m gold for Britain". The Daily Telegraph. 31 July 2010. Retrieved 31 July 2010. ^ "European Athletics 2010: Farah seals distance double". BBC Sport. 31 July 2010. Retrieved 31 July 2010. ^ "Diamond League: Mo Farah the first Briton to run sub-13 minutes". The Daily Telegraph. London. 19 August 2010. Retrieved 16 August 2013. ^ "Farah, Adlington and Williams among Olympic awards". BBC Sport. 21 December 2010. Retrieved 21 December 2010. ^ Sampaolo, Diego (1 January 2011). "Merga and Cheruiyot take dramatic victories in Bolzano". IAAF. Retrieved 1 January 2011. ^ Wenig, Jorg (8 January 2011). "Kipchoge and Masai prevail in snowy Edinburgh". IAAF. Retrieved 9 January 2011. ^ "Mo Farah Becomes British Olympic Hero, Wins 5,000 and 10,000-Meter Double". Bleacher Report Sport. 12 August 2012. Retrieved 21 June 2014. ^ Kessel, Anna (20 February 2011). "Mo Farah hits the heights as new methods pay off in Birmingham". The Guardian. London. ^ "Farah wins New York half-marathon". ESPN.co.uk. Retrieved 20 March 2011. ^ "Farah smashes UK record to win New York Half". Athletics Weekly. 20 March 2011. Archived from the original on 28 August 2011. ^ Mulkeen, Jon (4 June 2011). "Farah smashes European 10,000 m record, Mosop breaks distance world records". Athletics Weekly. Archived from the original on 7 June 2011. ^ a b "Mo Farah 1st in 5k and new British Record 12:53.11 Monaco Diamond League 2011". Flotrack. 22 July 2011. Archived from the original on 27 March 2012. Retrieved 13 August 2012. ^ "Daegu 2011: Farah storms to famous 5,000m gold at World Championships". More than the Games. 4 September 2011. Archived from the original on 8 June 2012. Retrieved 13 August 2012. ^ Orvice, Vikki (31 August 2011). "Mo Farah to blister through 5,000 metres". The Sun. London. ^ Glenday, Craig. Guinness World Records 2014. 2013 Guinness World Records Limited. ISBN 978-1908843-15-9. ^ Fordyce, Tom (4 August 2012). "Mo Farah wins Olympic 10,000m gold for Great Britain". BBC Sport. Archived from the original on 12 August 2012. Retrieved 13 August 2012. ^ Layden, Tim (11 August 2012). "In a Games filled with memorable moments, few resonate like Bolt". Sports Illustrated. Retrieved 13 August 2012. ^ Borden, Sam (1 August 2012). "Observance of Ramadan Poses Challenges to Muslim Athletes". The New York Times. ^ Fordyce, Tom. "Mo Farah wins men's 5,000m to claim second Olympic gold". BBC Sport. Archived from the original on 12 August 2012. Retrieved 13 August 2012. ^ Hart, Simon (25 August 2012). "Olympics hero Mo Farah aiming to break Steve Ovett's 34-year-old British record at Aviva Birmingham Grand Prix". The Daily Telegraph. London. ^ "Mo Farah celebrates two-mile Diamond League victory". BBC Sport. 26 August 2012. Retrieved 16 August 2013. ^ a b "2013 New Year's Honours" (PDF). Retrieved 29 December 2012. ^ "'Mistake' not to award Mo Farah a knighthood". ITV. 29 December 2012. Retrieved 2 January 2013. ^ a b Moss, Vincent (10 August 2013). "Mo-ment of madness: Fury over Farah's New Year Honours snub while bank watchdog is knighted". The Mirror. Retrieved 2 January 2013. ^ "Nick Clegg's rally speech at Liberal Democrat Autumn Conference". Nickclegg.com. 22 September 2012. Archived from the original on 3 January 2013. Retrieved 16 August 2013. ^ "Nick Clegg's New Year Message 2013". Libdems.org.uk. 28 December 2012. Archived from the original on 23 April 2013. Retrieved 16 August 2013. ^ Culzac, Natasha (18 August 2013). "Mo Farah: David Cameron backs calls to give Olympic gold medallist a knighthood". Metro News. Retrieved 13 August 2014. ^ Lewis, Aimee (19 July 2013). "Mo Farah breaks Steve Cram's 28-year British 1500m record". BBC Sport. Retrieved 16 August 2013. ^ "Diamond League: Sally Pearson wins in London as Mo Farah wins 3000m at Anniversary Games". ABC News. 28 July 2013. Retrieved 29 July 2013. ^ a b Morrison, Jonathan (10 August 2013). "Mo Farah wins 10,000 metres and fourth world title". The Times. Retrieved 10 August 2013. ^ Steinberg, Jacob (16 August 2013). "Mo Farah wins 5,000m gold to become double World and double Olympic champion". The Guardian. Retrieved 16 August 2013. ^ "Farah takes the distance double to rise amongst the greats". IAAF.org. 17 August 2013. Retrieved 13 August 2014. ^ Lewis, Aimee (16 September 2013). "Mo Farah wins 5,000m gold at World Athletics 2013". BBC Sport. Retrieved 16 September 2013. ^ Black, Dan (8 January 2014). "There's a catalogue of sport to look forward to in 2014!". Pendle Today. Retrieved 13 August 2014. ^ "Farah seals historic gold for Britain". Yahoo! Eurosport. Retrieved 29 August 2011. ^ Spink, Alex (11 December 2013). "BBC Sports Personality of the Year: Mo Farah not expecting to win despite historic 2013". The Mirror. Retrieved 13 August 2014. ^ Aspin, Guy (15 January 2014). "Mo Farah: London Marathon a huge test". The Scotsman. Retrieved 13 August 2014. ^ "Mo Farah finishes eighth on full London Marathon debut". BBC Sport. 13 April 2014. Retrieved 14 April 2014. ^ "Mo Farah was airlifted to hospital after bathroom collapse". BBC Sport. 12 August 2014. Retrieved 19 August 2014. ^ Casert, Raf (17 August 2014). "Mo Farah wins 5k to clinch long distance double at European Championships". CTV News. Associated Press. Retrieved 19 August 2014. ^ "European championships: Mo Farah wins 5000m and record fifth gold". BBC Sport. 17 August 2014. Retrieved 17 August 2014. ^ "Great North Run 2014: Mo Farah claims first victory". BBC Sport. 7 September 2014. Retrieved 7 September 2014. ^ "Mo Farah breaks indoor two-mile world record in Birmingham". BBC Sport. Retrieved 22 February 2015. ^ "Mo Farah breaks European half marathon record in Lisbon win". BBC Sport. 22 March 2015. Retrieved 7 June 2015. ^ Ingle, Sean (27 December 2013). "Memorable moments 2013: Mo Farah seals double-double at Moscow worlds". The Guardian. Retrieved 13 August 2014. ^ "American Galen Rupp Finishes 5th in 27:08.91 – 4th fastest American 10,000 in History". LetsRun.com. 22 August 2015. ^ "In victory and defeat, Kamworor and Farah now shift focus to Rio rematch". IAAF.org. 28 March 2016. Retrieved 16 August 2016. ^ Young, Dennis (26 March 2016). "Kenyan Duo Clobber Mo Farah As Kamworor Repeats at World Half". Flotrack.org. Retrieved 16 August 2016. ^ "3000 Metres Result | Glasgow Indoor Grand Prix". IAAF.org. 20 February 2016. Retrieved 16 August 2016. ^ "Mo Farah breaks 34-year-old British 3,000m record and dedicates victory to 'hero' Muhammad Ali". London Evening Standard. Press Association. 5 June 2016. Retrieved 19 July 2016. ^ "Road to the Olympic Games". CBC Sports. Retrieved 16 August 2016. ^ "A closer look at the 2016 World Athlete of the Year men's finalists". IAAF.org. Retrieved 16 August 2016. ^ Etchells, Daniel (15 October 2016). "Farah and Beitia crowned European athletes of the year". Insidethegames.biz. Retrieved 16 August 2016. ^ a b "Mo Farah Falls but Hardly Misses a Step in 10,000-Meter Victory". The New York Times. 13 August 2016. Retrieved 14 August 2016. ^ "Magical Mo Farah bags another Olympic gold and earns his place in history". The Guardian. 22 August 2016. Retrieved 22 August 2016. ^ "Great North Run 2016: Mo Farah wins third time in a row". BBC News. Retrieved 16 August 2016. ^ "European Athletics Convention: Golden Tracks awards ceremony". Insidethegames.biz. 15 October 2016. Retrieved 16 August 2016. ^ "Bolt, Thompson among IAAF Athlete of the Year finalists". Jamaica Gleaner. 9 November 2016. Retrieved 16 August 2016. ^ Blott, Unity (22 November 2016). "Biggest TV moments of 2016 revealed including Andy Murray winning Wimbledon". Daily Mail. Retrieved 16 August 2016. ^ "Mo Farah set for final track appearance in Zurich after World Championships". BBC Sport. 28 July 2017. ^ Lowell, Hugo (2017-08-04). "Mo Farah wins tenth successive global title in men's 10,000m at World Championships". inews.co.uk. Retrieved 2019-02-10. ^ "World Championships 2017: Mo Farah defends his 10,000m title in London". BBC Sport. 4 August 2017. Retrieved 14 November 2017. ^ "World Championships 2017: Mo Farah misses out on fifth consecutive distance double". BBC Sport. 12 August 2017. Retrieved 14 November 2017. ^ "Mo Farah wins final race in Britain at Birmingham Diamond League meeting". BBC Sport. 20 August 2017. Retrieved 14 November 2017. ^ a b "Mo Farah wins his final track race in Zurich Diamond League event". BBC Sport. 24 August 2017. Retrieved 14 November 2017. ^ "Full Results 2017 Weltklasse Zurich Diamond League". LetsRun.com. 24 August 2017. Retrieved 14 November 2017. ^ Lowell, Hugo (2017-08-20). "Mo Farah insists he will never again compete in British vest". inews.co.uk. Retrieved 2019-02-10. ^ "Great North Run: Mo Farah wins record fourth successive title". BBC Sport. 10 September 2017. Retrieved 14 November 2017. ^ "2017 Great North Run Results". LetsRun.com. 11 September 2017. Retrieved 14 November 2017. ^ "Mo Farah splits from coach Alberto Salazar and will return to Britain". BBC Sport. 31 October 2017. Retrieved 14 November 2017. ^ "Sir Mo Farah smashes British record at hottest ever London Marathon". Retrieved 22 April 2018. ^ Dean, Sam; Bull, J. J. (22 April 2018). "London Marathon 2018 live race updates: Mo Farah finishes third in British record time". Retrieved 22 April 2018 – via www.telegraph.co.uk. ^ "Great North Run 2018: Mo Farah wins for record fifth time". BBC News. 9 September 2018. Retrieved 9 September 2018. ^ "Mo Farah wins first marathon title with dramatic victory in Chicago". The Guardian. The Guardian. Retrieved 7 October 2018. ^ "London winners face Mo Farah at Big Half". Athletics Weekly. 2019-02-07. Retrieved 2019-02-25. ^ "Farah: 2020 is on the cards". BBC News. Retrieved 2019-02-25. ^ Ingle, Sean (2018-11-20). "Mo Farah to run 2019 London marathon but leaves door open for track return in Tokyo". The Guardian. ISSN 0261-3077. Retrieved 2019-02-25. ^ "Sir Mo Farah considering track return ahead of 2020 Olympics". Sky Sports. Retrieved 2019-02-25. ^ "Farah gets financial backing ahead of World Championships in Qatar". Evening Standard. 2018-11-13. Retrieved 2019-02-25. ^ "London Big Half Marathon". BBC Sport. BBC. 10 March 2019. Retrieved 10 March 2019. ^ "Mo Farah's Mobot dance invented by Clare Balding". The Telegraph. London. 12 August 2012. Retrieved 13 August 2012. ^ "Meet the real 'Mobot' – track champ who's simply electric". This is Plymouth.co.uk. 15 September 2012. Archived from the original on 5 December 2012. Retrieved 16 August 2013. ^ Miles, Stuart (26 November 2012). "Could Mo Farah's Do the Mobot be the new Gangnam Style? Internet sensation in the making". Pocket-lint.com. Retrieved 16 August 2013. ^ "Olympic hero Mo Farah has confirmed he will take part in this year's Commonwealth Games in Glasgow". Daily Record. 12 May 2014. Retrieved 16 August 2016. ^ Farah, Mo (6 October 2013). "Mo Farah: I missed my twin brother Hassan so much during our 12-year separation". The Daily Telegraph. ^ aliceD (4 April 2010). "Mo Farah's wedding". All-Athletics.com. Retrieved 29 August 2011. ^ Kessell, Anna (11 August 2012). "London 2012: Marathon runner Scott Overall inspired by Mo Farah". The Guardian. Retrieved 14 August 2012. ^ Orstein, David (22 December 2011). "BBC Sports Personality of the Year 2011 as it happened". BBC News. Retrieved 15 July 2012. ^ "Olympic hero Mo Farah father of twin girls". BBC News. 25 August 2012. Retrieved 28 August 2012. ^ a b "Olympic hero Mo Farah applies to be tax exile in bid to save millions". Daily Record. 12 January 2014. Retrieved 12 January 2014. ^ Mo Farah splits with coach Alberto Salazar ahead of move back to London. The Telegraph. ^ Lusher, Adam (4 August 2012). "London 2012 Olympics: Mo Farah wins gold medal in the 10,000 metres final". The Daily Telegraph. London. ^ a b c "Sports stars Mo Farah and Amir Khan join list of supporters". Muslim Writers Awards. Archived from the original on 1 July 2012. Retrieved 17 July 2012. ^ Milmo, Cahil (10 August 2012). "Mo Farah seeks a peaceful haven as he prepares for second date with Olympic destiny". The Independent. London. Retrieved 10 August 2013. ^ "Influencing Muslims: The 500 Most Influential Muslims". PR Newswire. Retrieved 4 December 2013. ^ "TV Online: Mo Farah at Emirates Stadium". Arsenal FC Official website. London. 1 September 2010. Archived from the original on 4 September 2010. ^ a b "Mo Farah calls on Arsene Wenger to sign him up as Arsenal fitness coach". Metro. 4 September 2012. Retrieved 14 December 2015. ^ Shrestha, Sarad (27 September 2016). "UK Olympic hero Mo Farah eyes Arsenal fitness job". Tribal Football. Retrieved 16 August 2017. ^ Farah, Mo (7 October 2013). "Mo Farah: This is my moment, my race – I will not be beaten at the London Olympic Games". The Daily Telegraph. Retrieved 13 October 2013. ^ "Justin Bieber is Bing's most searched for person of 2013". Irish Independent. 2 December 2013. Retrieved 14 December 2015. ^ a b Usborne, Simon (4 August 2012). "Mo Farah: Young man in a hurry". The Independent. London. Retrieved 16 August 2012. ^ "Mo Farah has become the first person to beat The Cube!". Official Phillip Schofield.com. 1 February 2012. ^ Heaven, Douglas (14 August 2012). "Olympic stars unite to promote global hunger summit". New Scientist. Retrieved 16 August 2012. ^ "Mo Farah stamp sold at London 2012 auction". BBC. 28 April 2013. Retrieved 1 August 2013. ^ Muir, Hugh (26 July 2013). "Mo Farah pleads with Barclays not to end remittances to Somalia". The Guardian. London. Retrieved 29 July 2013. ^ "Robbie in Budget appeal to Chancellor to urge him to force firms to pay tax in world's poorest countries". The Sun. 14 March 2013. Retrieved 14 December 2015. ^ "Stars back brain tumour funding after girl, 6, given two years to live". London Evening Standard. 27 October 2016. Retrieved 16 August 2016. ^ "Mo Farah Reveals his Next Step". Nike News. Retrieved 10 August 2017. ^ "Nike commercial features Seattle Seahawks cornerback Richard Sherman". The Oregonian. 20 January 2014. ^ "Men's 'Mobot' Tee". Mo Farah Store. Archived from the original on 24 April 2014. Retrieved 13 August 2014. ^ Duffin, Claire (11 August 2012). "London 2012: Athletes in line to make millions after the Games". The Daily Telegraph. Retrieved 16 August 2012. ^ Riley, Lisa (21 December 2013). "Quorn signs up Mo Farah for new ads appealing to fitness fans". The Grocer. Retrieved 13 August 2014. ^ Wilkes, David (15 October 2013). "'I always get stopped': Mo Farah reveals his trouble at US immigration thanks to his full name". Mail Online. London. Retrieved 16 October 2013. ^ "Olympic Hero Mo Held in US Terror Blunder". Sky News. 30 December 2012. Retrieved 1 January 2013. ^ "Somalia-born Olympic Champion Mo Farah Troubled by Trump's Travel Ban". NBC News. Associated Press. Retrieved 16 August 2016. ^ "Mo Farah: Olympic champion says he was racially harassed at German airport". 6 March 2018. Retrieved 22 April 2018 – via www.bbc.co.uk. ^ "Mo Farah hits out at media for 'making something out of nothing' after IAAF labelled him 'likely doper'". The Daily Telegraph. 9 July 2017. Retrieved 7 November 2018. ^ "Mo Farah was suspected, then cleared, of doping by IAAF expert". The Guardian. 6 July 2017. Retrieved 7 November 2018. ^ "New Fancy Bears leak says IAAF cleared Mo Farah after doping fear". The Daily Telegraph. 5 July 2017. Retrieved 7 November 2018. ^ "Mo Farah". Facebook. Retrieved 13 August 2017. ^ "Mo Farah: Missing drugs tests easy - Mark Lewis-Francis". BBC Sport. 21 June 2015. Retrieved 13 August 2017. ^ "About ADRV". IKAD.org.uk. Retrieved 1 November 2017. ^ "Banned athlete investigated after Mo Farah training pictures". ESPN. 4 March 2015. Retrieved 6 June 2015. ^ Keel, Toby (28 February 2015). "Athletics – Mo Farah pictured training alongside banned drug cheat". Yahoo! Eurosport UK. Archived from the original on 2 April 2015. Retrieved 7 June 2015. ^ "Mo Farah's trainer Alberto Salazar and partner Galen Rupp accused of doping offences". The Independent. London. 4 June 2015. Retrieved 4 June 2015. ^ "Mo Farah pulls out of Birmingham Diamond League race". BBC Sport. 7 June 2015. Retrieved 7 June 2015. ^ Slater, Matt. "Questions mount over Alberto Salazar's links to Mary Slaney". BBC Sport. Retrieved 12 June 2015. ^ "Mo Farah says he is 'a clean athlete' and 'frustrated' by leaked report on Salazar". BBC Sport. 26 February 2017. Retrieved 26 February 2017. ^ a b c "Farah: male athlete of 2016". British Athletics Writers' Association. Retrieved 13 August 2014. ^ "Aviva Athletics Awards 2010". UKA.org.uk. 6 December 2012. Retrieved 19 September 2012. ^ "London Youth Games Hall of Fame 2010". London Youth Games.org. 10 September 2010. Retrieved 16 August 2013. ^ "Farah handed 2011 European award". BBC News. 5 October 2011. ^ "Farah and Ennis voted British Athletes of the Year". UKA.org.uk. 26 October 2012. Retrieved 28 October 2012. ^ Hart, Simon (5 October 2012). "Mo Farah voted European male athlete of the year for second year". The Daily Telegraph. Retrieved 10 October 2012. ^ "Farah, Adams and Rees among AW Readers' Choice award winners". Athletics Weekly. 5 December 2013. Archived from the original on 16 February 2014. Retrieved 13 August 2014. ^ "BOA Announce Olympic Athletes of the Year 2013". Team GB. 23 December 2013. Retrieved 13 August 2014. ^ Young, Ken (30 December 2013). "The Running Times 2013 Runners of the Year". Running Times. Retrieved 13 August 2014. ^ "Usain Bolt, Mo Farah and Serena Williams up for top prize". The Voice Online. 31 January 2014. Retrieved 13 August 2014. ^ "The 50 Most Influential People in Running". Runner's World. Retrieved 14 December 2015. ^ "2015 LRC Year-End Rankings, Men's 5,000: Mo Farah (Who Else?) Is No. 1 in World; Ben True, Galen Rupp & Ryan Hill Lead A Fine Crop of Americans". LetsRun.com. Retrieved 19 July 2016. ^ "2015 LRC Year-End Rankings, Men's 10,000: Surprise, Surprise – Mo Farah And Galen Rupp Are The World And US #1s". LetsRun.com. Retrieved 19 July 2016. ^ Weekly, Athletics (4 November 2016). "Jessica Ennis-Hill and Mo Farah are BAWA athletes of the year". Athletics Weekly. Retrieved 16 August 2016. ^ Weekly, Athletics (20 November 2016). "Mo Farah voted BASC athlete of the year". Athletics Weekly. Retrieved 16 August 2016. ^ a b Weekly, Athletics (8 December 2016). "Farah and Ennis-Hill among winners in 2016 AW Readers' Choice Awards". Athletics Weekly. Retrieved 16 August 2016. ^ Hinds, Rodney (23 March 2017). "British Ethnic Diversity Sports Awards honoured Sir Mo". Voice Online. Retrieved 1 April 2018. ^ Trehan, Dev (7 May 2017). "BEDSA 2017 Highlights". Sporting Equals. Retrieved 1 April 2018. ^ "Mo Farah & Kadeena Cox win British Ethnic Diversity Sports Awards awards". BBC Sport. 18 March 2017. ^ "Mo Farah named Celebrity Dad of the Year". ITV. 15 June 2013. Retrieved 1 August 2013. ^ Molloy, Antonia (2 February 2014). "Wildlife presenter David Attenborough is named the UK's most trustworthy figure". The Independent. London. ^ "World's 100 Most Powerful Arabs". Arabian Business. Retrieved 19 August 2014. ^ Fox, Boudicca. "The 50 greatest Britons revealed: Wills and Kate are in but where are Bobby Moore and Thomas Hardy? – Mirror Online". Mirror.co.uk. Retrieved 19 July 2016. ^ Edmonds, Lizzie (29 January 2016). "Mo Farah named sports hero Londoners are most proud of". London Evening Standard. Retrieved 19 July 2016. ^ "Mo Farah's daughters drench track star with slime as he accepts Nickelodeon Kids' Choice Award". The Sun. 11 March 2016. Retrieved 19 July 2016. ^ "Sir Lenny Henry and Mo Farah among top 10 most influential black Britons". Belfast Telegraph. Retrieved 16 August 2016. ^ "Mohamed Farah Mukhtar". Association of Road Racing Statisticians. Retrieved 5 October 2015. ^ "5000 Metres Result". IAAF.org. 18 February 2017. Retrieved 16 August 2016. ^ "Chicago Marathon 2018 Results". 7 October 2018. Retrieved 7 October 2018. ^ "Win Mo Farah: No Easy Mile on DVD". HeyUGuys. Retrieved 16 August 2017. ^ "Mo Farah". Soundcloud.com. Retrieved 14 November 2017. Wikimedia Commons has media related to Mo Farah. Mararike, Shingi (25 September 2016). "A life in the day: Mo Farah, Olympic legend". The Sunday Times.